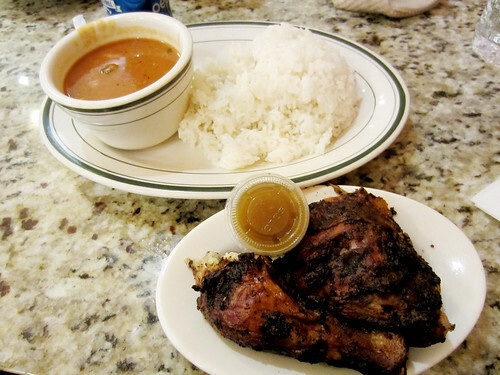 In brief: I don't know what the yelpers have against the Mott Haven location of El Valle but M. and I were in ecstasy over the $6.50 lunch combo. You gotta love a place where they ask if you want a soda, I nod yes, and they bring me Pepsi. Because here soda means Pepsi. It could have been because this April chilliness was making us cranky with cold, but when the waitress set down plates of gorgeously charred chicken, a pile of white rice and a small cup of beans, we sighed in happiness. The chicken was even better than imaginable with the vinaigrette sauce that came on the side. M. and I wolfed, inhaled, devoured lunch and left on a blissful cloud of satiation.